I remember the first time I saw Dr. Brené Brown talk about her research. I was sitting at a yoga retreat, in Mexico, listening to the teacher speak about “vulnerability”. My inner voice said, “Yea, easy for you to say, vulnerability is for those not strong enough to be assertive in their lives. I’ve tried vulnerability, it sucked, I lost.” Then I saw Brené’s courageous, heart-felt and intelligent TEDx talk, streamed into the yoga conference through YouTube. That was 5 years ago. 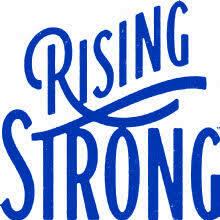 Way and Rising Strong workshops, that Brené developed from her 15 years of research into what makes a human life filled with purpose, joy and understanding , I have come to understand the difference between vulnerability and weakness. I better understand the issues that shame breeds in our lives and how it keeps us trapped in having the same conversations with the same people about the same things, all the while we hide what hurts us, we hold back our hearts, our thoughts and opinions and “make nice” so no one gets upset. “You are weak and small”, is shame’s voice in your head. Shame wants you to believe that you are weak for feeling, it wants you to continue to hide so that it can grow in the dark, keep your secrets, and hold you hostage in the silence and isolation with feelings of being “worth less” than others. I have come to know how subtle our protection can become as we build a noble suit of armor so that we can appear brave, perfect, bullet-proof and gallant in our attempts to fit in and to be seen as competent and strong. Ironically, our armoring tricks us into believing that it will protect us from further hurt. The truth is it only weighs us down with the volumes of rules about being perfect, strong, and acceptable to others. All the while, we lose the most precious commodity we have in our lives, our intimate connections with those we love, including our primal connection with our self, our True Self. Only when we fall off our noble steed in the inevitable tumble of a divorce, a job loss, a death, or a diagnosis, do we realize how unwieldy our rusted armor has become. Now we need a good blacksmith, in the form of a therapist, counselor, or coach to help up get up from that fall! And here is the good part…without the fall or failure, we would have never known how truly strong we are. This is the work of rising up to meet who we really want to be in our lives. That takes emotional risk, the true definition of vulnerability. In that recover process, through emotional risk and revelation, we develop new skills, attitudes and behaviors that will shower us with the joy of emotional freedom. The process of rising up, after we have a devastating life crisis, introduces us to the most incredible love, wisdom, resolve, courage and peace we have ever know. For without the armor protecting our wounded ego, we can truly be free to live who and what we are. The process is not without pain. To take back the truth of who we are, we will be required to get to know the story of our lives and to rumble with rewriting it. Once you learn that you are the absolute and worthy author of the story of your life, you will no longer have to hide and you will no longer feel the pain of the isolation from yourself and others. You get yourself back. Brené says that, “When you watch someone being vulnerable it looks a lot like courage!” Vulnerability is the birth place of all new beginnings, creativity, joy, connection, compassion and ultimately….real courage. The courage to be Who You Really Are!